Zionist Mass Murder - Break the Siege, Defend Gaza! Israeli Militarists, U.S. Imperialism and Its Arab Pawns! Break the Siege, Defend Gaza! Bush and Obama Back Zionist Butchers – Drive U.S. Imperialism Out of Iraq, Afghanistan and the Near East! For an Internationalist Workers Party! Just before noon local time on Saturday, December 27, Israeli warplanes launched a massive bomb attack on the densely populated Gaza Strip. 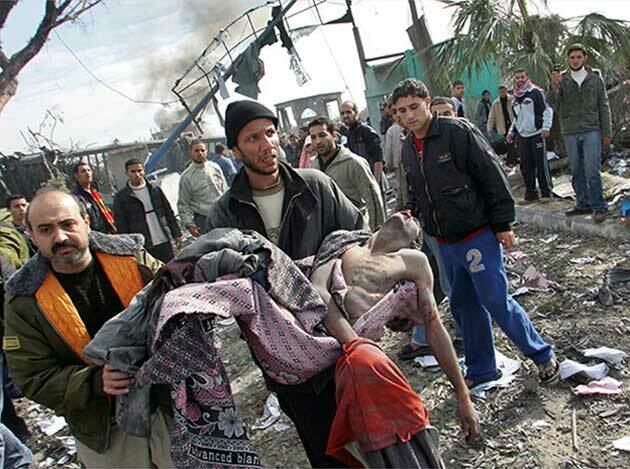 More than 270 Palestinians were killed as wave after wave of U.S.-supplied F-16 fighter jets and Apache helicopters dropped more than 100 bombs. Another 15 were killed by renewed air strikes on Sunday as Israeli infantry and tanks massed on the border for a possible ground invasion reoccupying the area where 1.5 million people are jammed into 140 square miles, barely twice the size of Washington, D.C. 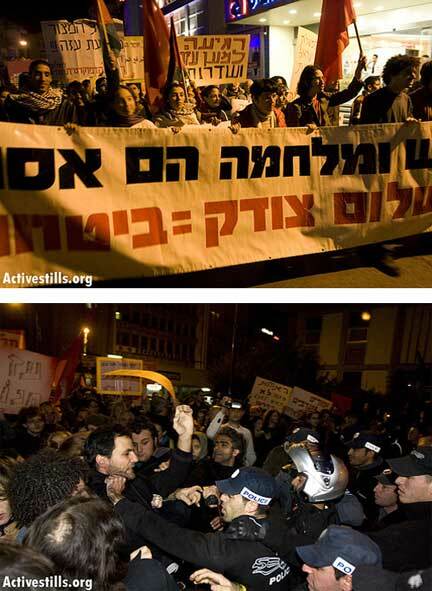 The attack on Gaza sparked demonstrations in West Bank cities including several thousand in Nazareth, while hundreds of Jewish and Arab leftists marched in Tel Aviv to protest the Israeli assault. Police attacked the demo and arrested a number of protesters. The Israeli military said they were targeting Hamas installations, and the bombs hit numerous government offices in Gaza City and the southern town of Rafah. The Islamic fundamentalist movement Hamas won Palestinian elections in January 2006 and has ruled Gaza as its elected government for the last year and a half. Many of the dead were police officers, although numerous civilians were killed, including a number of children, as schools had just let out for lunch. The Zionists’ attack on downtown areas was deliberate mass murder. The Israeli slaughter was carried out with the full knowledge and a green light from its imperialist patrons in Washington, as well as U.S. client regimes such as Egypt. The White House issued a statement blaming Hamas for breaking the truce with rocket attacks. The few dozen Qassem rockets launched from Gaza were in retaliation for earlier Israeli attacks and have not killed a single person, while injuring only a handful. Meanwhile, Israel has completely sealed off Gaza for over a week, not allowing in food, fuel or even medical supplies. While Israeli and U.S. spokesmen and their kept media routinely label Hamas “terrorist,” the actions of this conservative Islamist movement can’t even come close to the routine terror bombings and indiscriminate attacks on the Palestinian people by the Zionists and their imperialist patrons. Meanwhile, U.S. colonial occupation forces kill hundreds of Iraqis and Afghans monthly. Israel’s siege of Gaza is an attempt to terrorize and starve the Palestinian population into submission akin to the Nazis’ “collective punishment” in occupied Europe. The Internationalist Group and League for the Fourth International condemn the Israeli mass murder in Gaza and call for action by the international working class in defense of Gaza and the Palestinian people, including efforts to break the siege. Impotent consumer boycotts of Israeli goods or Israeli academics do not target the Zionist rulers or their imperialist backers, whereas a refusal by transport workers to unload Israeli ships or planes is the kind of class action that could send a powerful message to the racist rulers. Last May 1, dock workers in the U.S. shut down all 27 West Coast ports to stop the war in Iraq and Afghanistan, while demanding immediate withdrawal U.S. troops from the entire Middle East. If such actions were repeated, particularly in Europe, it could strike a powerful blow in defense of the besieged Palestinian masses. As we pointed out in a previous article (“Defend Gaza! 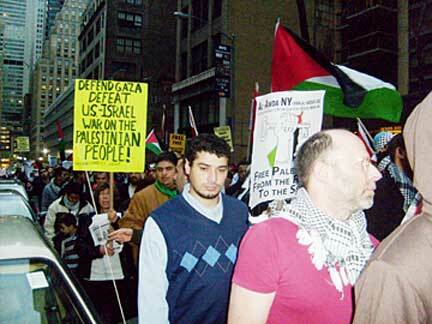 Defeat U.S./Israel War on the Palestinian People!” The Internationalist No. 27, May-June 2008), in addition to supplying the Israeli war machine with advanced weaponry, the Pentagon now effectively controls the military forces of Fatah, headed by Palestinian Authority president Mahmoud Abbas. In the West Bank, Fatah paramilitary forces, armed and advised by the U.S., suppress opponents of the Zionist occupation. While giving no political support to the Islamist Hamas, or to various Palestinian nationalist groups, we call to defeat the joint Israeli/U.S./Fatah war. The first task today must be to defend the Palestinian people against the Israeli occupier and oppressor. Recognizing the Palestinian right to self-determination and to a Palestinian state, proletarian internationalists also recognize the right to existence and national self-determination of the Hebrew-speaking population while opposing a religion-based, ethnically exclusive regime such as Zionist Israel – a state founded on the basis of stealing the Palestinians’ lands and expelling the people – is inherently oppressive to the non-Jewish population and Arabs in particular. “Clearly our call is today that of a tiny minority, but as the dead end of Zionism, Palestinian nationalism and Islamic fundamentalism is made increasingly clear, many on both sides of the national divide are recognizing there can only be a harmonious resolution of competing claims in the framework of a single state. Our key point is that such a state is impossible without a revolution through the joint efforts of Palestinian Arab and Hebrew-speaking working people. It will be necessary for Israelis themselves to deal with the Zionist butchers who have terrorized the Palestinian population, while Palestinians must throw off the hold of Islamicists who relegate women to the status of chattel, of domestic slaves.